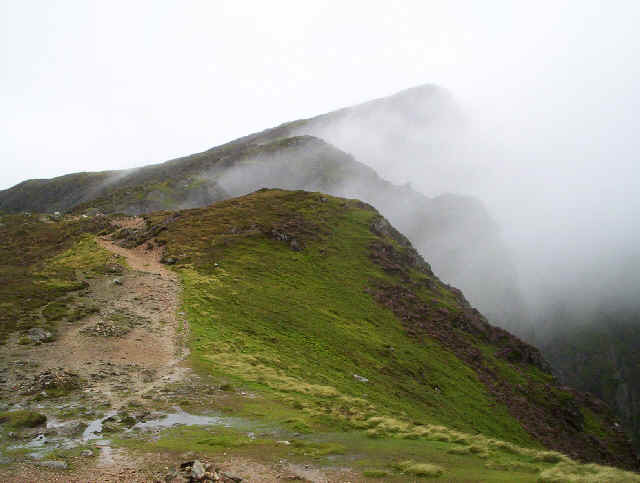 Cadair Idris and its various summits is a relatively easy hill to climb using public transport and lends itself to a linear walk from Minffordd to Dolgellau. I caught the bus (service X32 runs every two hours) just after 9.15 from Dolgellau and by 9.45 was leaving the car park (with toilets!) at Minffordd. 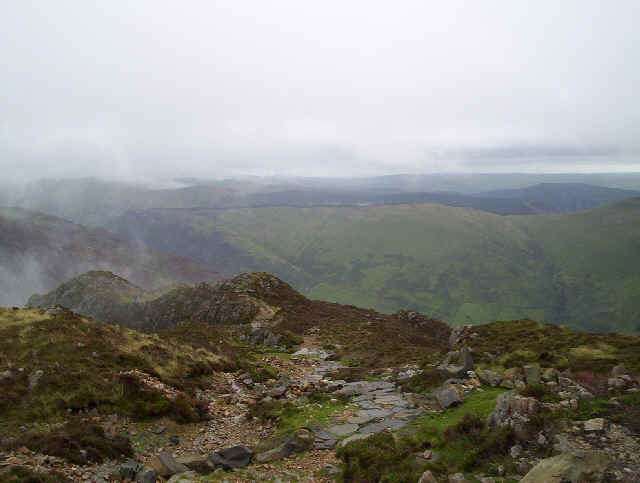 Almost as soon as I started walking so did the rain, which was to continue every day of my week's walking in the North Wales in August 2008. The path from Minffordd was diverted because of tree felling around the woods so I had a view of Tal-y-llyn Lake. 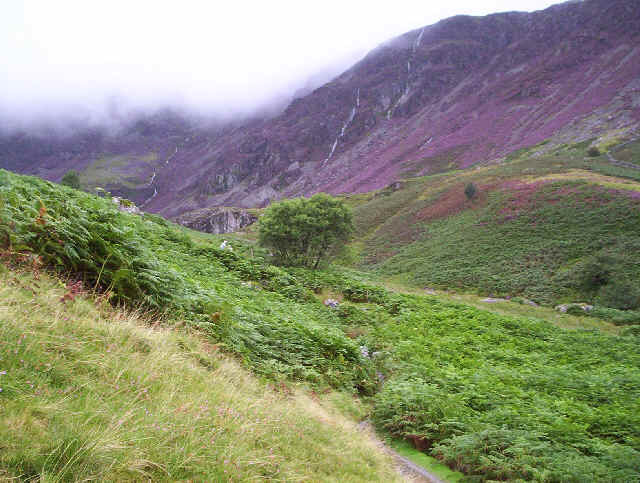 It then climbs steeply, and partly on steps out of the valley through woods to emerge onto the open hillside in Nant Cadair. 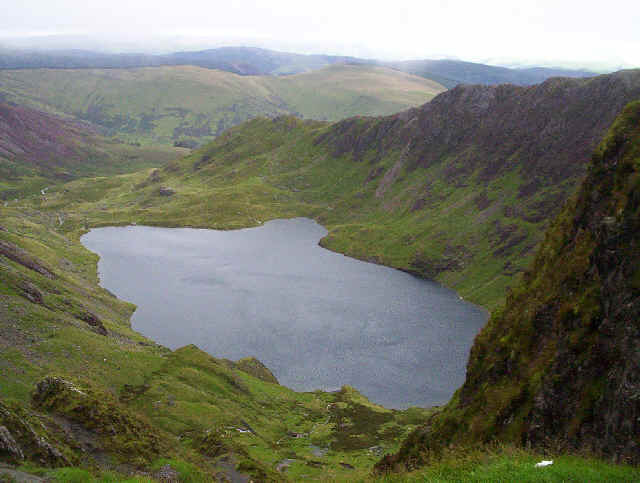 It now climbs steadily, but relatively gently, to the cwm which holds Llyn Cau. 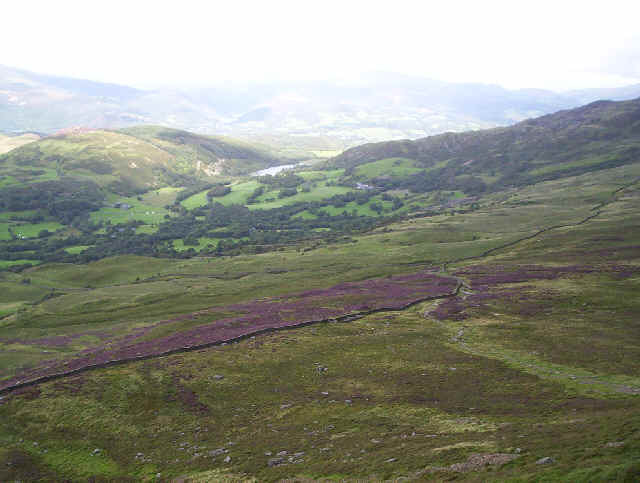 I followed the track down to the lake before returning the same way, for a few hundred yards, and cutting across the moorland to rejoin the Minffordd Path which continues climbing up to Craig Lwyd. Once on the ridge the path swings westwards to head for the first summit of the day, Craig Cwm Amarch (791m - 2585 feet). 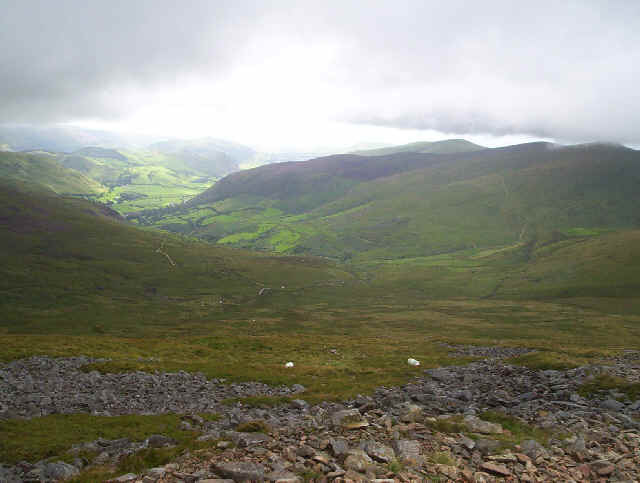 The path is often close to the cliff edge to the north with enormous drops down to the lake, whilst to the south are extensive views across mid Wales. The summit of Craig Cwm Amarch peeps through the cloud. 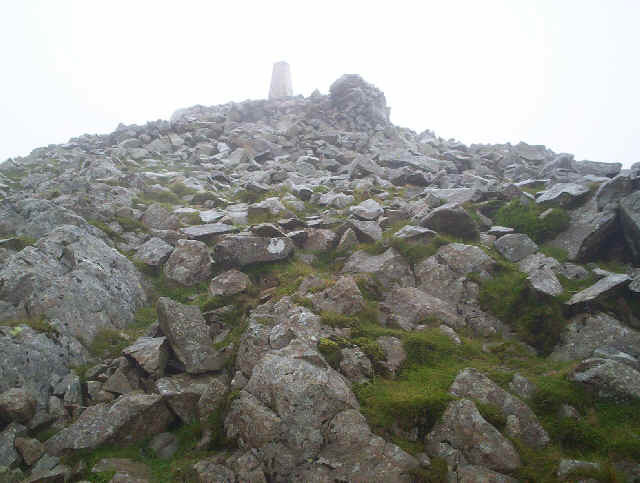 Sadly, the cloud base was low and all views disappeared as I climbed up to the summit of Cadair Idris (893m - 2930 feet). It had taken me two and a half hours from Minffordd. Torrential rain and strong gusts of wind made this section of the walk somewhat unpleasant. Eventually the summit cairn appeared out of the gloom and, more importantly, a few metres away is the substantial shelter. I don't normally like to see buildings on top of mountains but, on this occasion, I was more than happy to spend half an hour inside whilst I considered the options for the rest of the day. 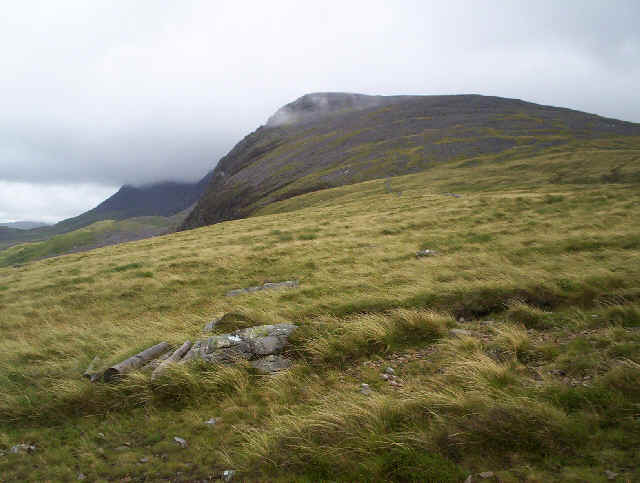 I'd intended to visit the summit of Cyfrwy before returning to Cadair Idris and then head north-eastwards to Mynedd Moel and Gau Craig. However, conditions were highly unpleasant and showed no immediate sign of improvement, so I decided that the best option was to take the "Pony Track" off the hill, visiting Cyfrwy on the way. First of all, of course, I had to find the beginning of "Pony Track", which was accomplished with the use of the compass and a GPS position. 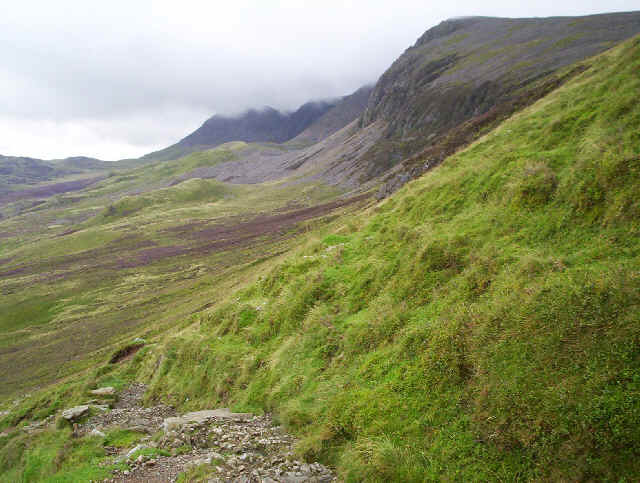 In clear weather this would be no problem but in visibility of less than 10 metres and a howling wind, and with the cliffs above Cadair Idris's second lake, Llyn y Gadair, falling menacingly away, accurate navigation is a good idea! After dropping down to about the 760m contour, an obvious track leaves the Pony Track and rises gently to the stony summit of Cyrfrwy (811m - 2661 feet). 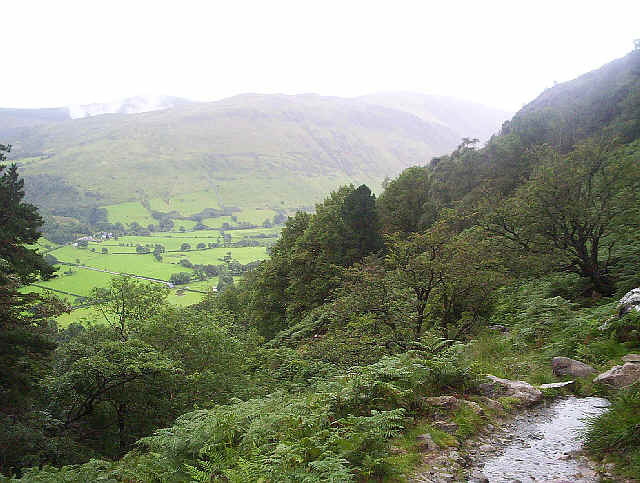 After reaching the summit I retraced my steps to the Pony Track and headed off down hill towards the lane at Ty-nant. By now the clouds had lifted slightly, at least giving me a view of the cliffs on the North side of Cadair Idris, although the summits were still covered in mist. Looking back to Cyrfrwy - inevitably it's now almost clear of cloud! Cadair Idris and Mynedd Moel remain stubbornly covered with clouds. The end of the Pony Track leads down to a lane across heather covered moorland with Llyn Gwernan bathed in sunlight. 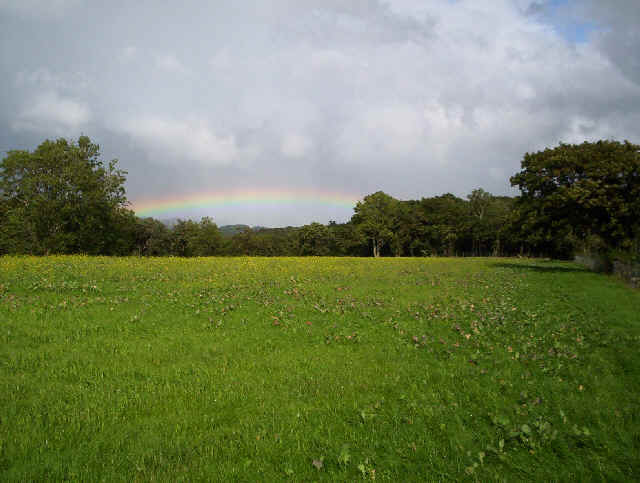 A pleasant walk of about an hour past Llyn Gweran lake was rewarded with blue skies and a spectacular rainbow. I was back in Dolgellau about five o'clock after an enjoyable but slightly frustrating day's walk.